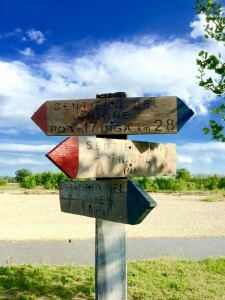 The Sentiero del Tidone is a 69 km footpath that passes through 2 Regions:- Emilia Romagna and Lombardy. It starts in the Province of Piacenza at Loc. Gerra Vecchia on the banks of the river Po and winds its way along the Tidone river, up and past the Molato Dam Lake and through the Province of Pavia to its source. Apart from a few kilometres (where the path uses secondary roads) the rest is gravel or hard ground and there are 6 fords across the river with alternative signposted paths for walkers and cyclists. Along the the route there are wooden signposts indicating the way and distances. In the upper part of the valley there are 3 picnic areas and information boards about local flora and fauna.